Another outing to a historic New Jersey property, this time to historic Walnford in Upper Freehold, south, in Monmouth County. The museum presents a meticulously maintained industrial community showing two centuries of social and technological history: a grist mill and - in the day - support services provided by a blacksmith, a cooper, and a store. 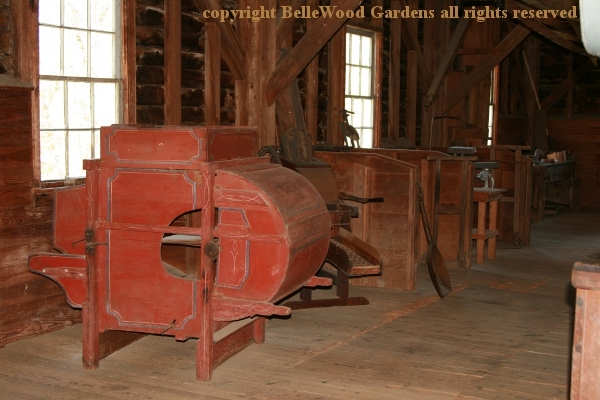 Much of the site's interpretation is connected to the newly restored and operating late 19th century working gristmill. It includes a large, beautifully restored home built for the Waln Family in 1774, as well as an 1879 carriage house, a cow barn, and assorted outbuildings and farm structures. Built over the generations by the Waln family, the static museum is a wonderful period piece that offers a look at the evolution of the property over 200 plus years. 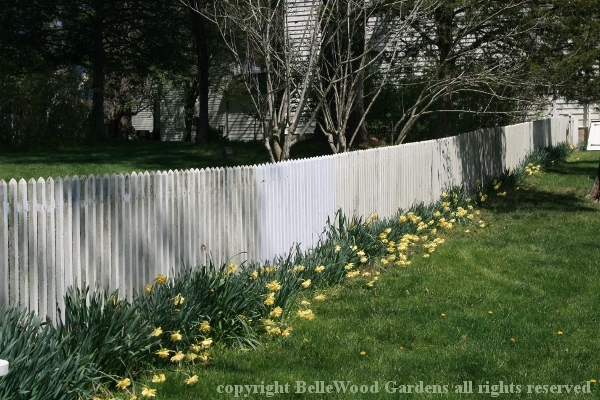 Daffodils line the fence along a road that fronts the house. 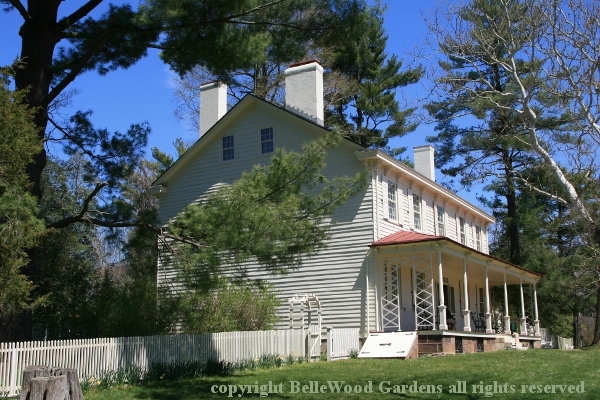 The elegant Waln House is Monmouth County's largest existing pre-revolutionary home. All of the furnishing, both those from the family and others that were "brought in"
on a settee . 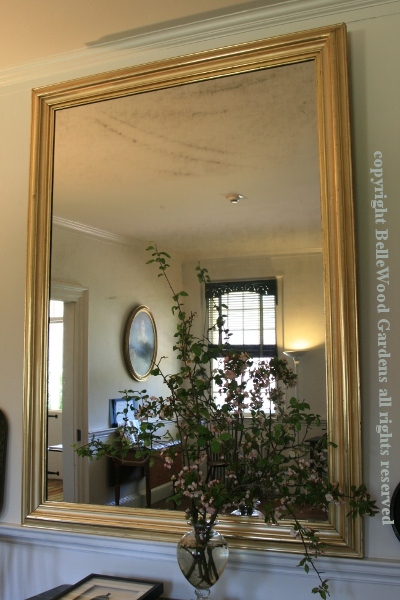 . . and a splendid gilded mirror offering a view through the looking glass. 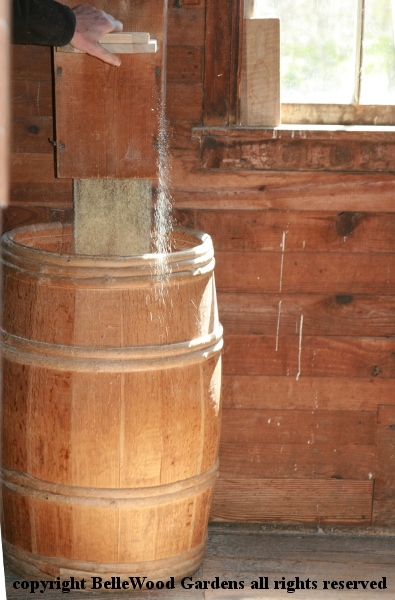 A foundation of the family's fortunes, the grist mill was one of three mills powered by the water from Crosswicks Creek. The grist mill was updated over the years: after a disastrous fire in 1872, then more recently restored after a flood. 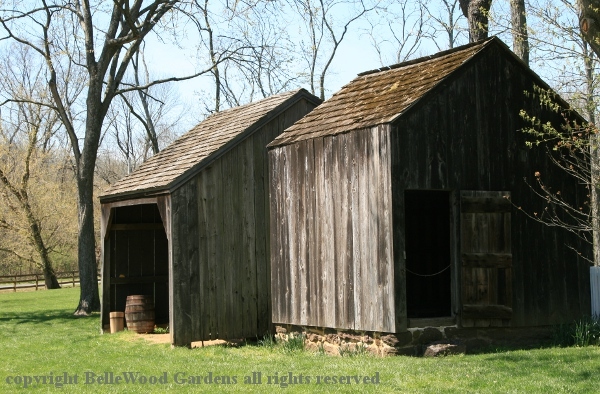 Today the mill offers a look at 18th and 19th century commercial life. Farmers grew the grain, millers ground it. The Walnford mill ground wheat and rye into flour, likely would also hull barley, crushed oats for livestock feed, and ground corn for both people and livestock. 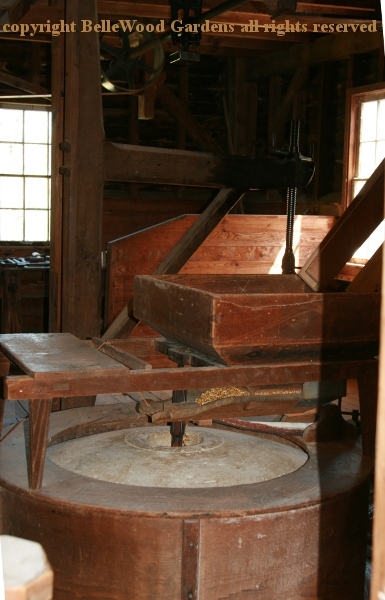 Today the mill is actually in operation, grinding corn when visitors are here to observe. 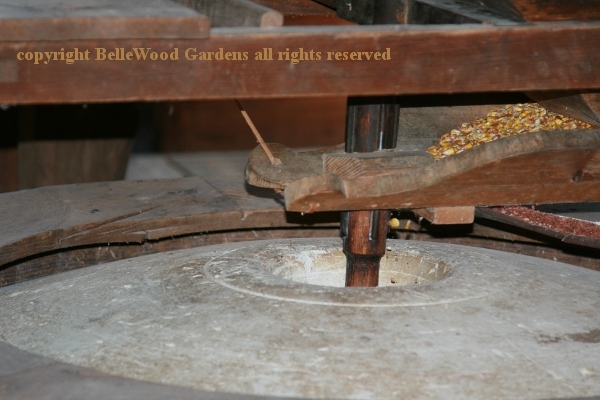 Corn feeding into the millstones. Ground corn, dropping down into a barrel. 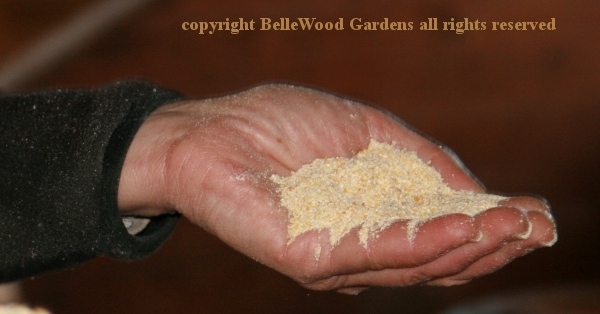 A handful of the beautiful, stone ground cornmeal. Wish they had some for sale. 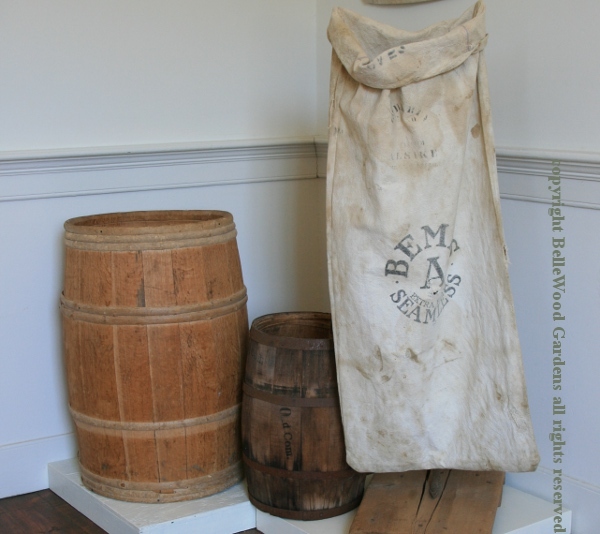 One of the displays, back in the house, of barrels and a bag for the miller's ground grains. 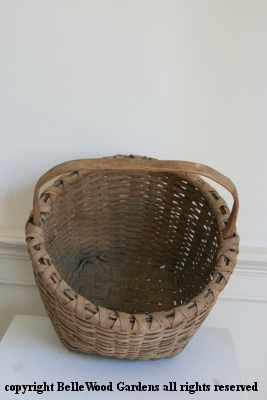 And an ash splint basket. 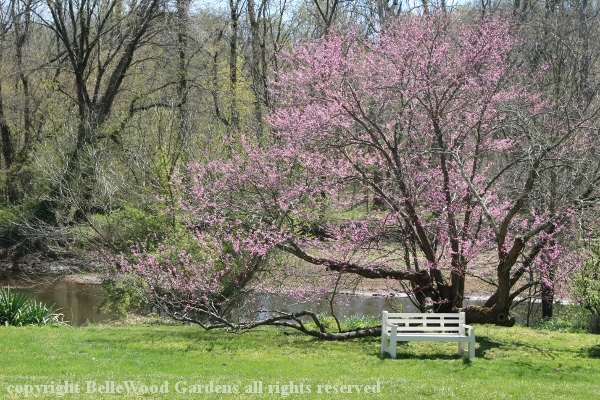 A beautiful Spring day, big old redbud in bloom, and a bench by Crosswicks Creek. A small wagon shed and a smoke house are two more outbuildings on the property.